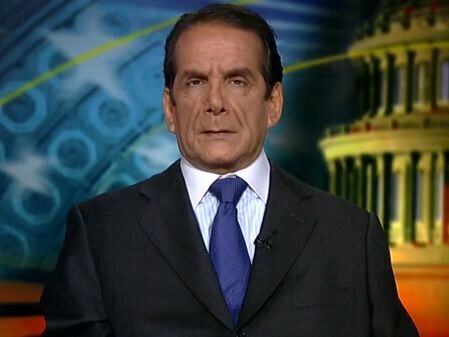 Krauthammer On Obama: "One Of The Emptiest Speeches I Have Ever Heard"
CHARLES KRAUTHAMMER: I was stunned. This is a man who gave one of the great speeches of our time in 2004, and he gave one of the emptiest speeches I have ever heard on a national stage. Yes, it had cadence, and yes, there were deceptions in it, but that is not what is so striking about it. There was nothing in it. This is a man who believes that government can and should do a lot. There is nothing in here that tells us how he's going to go from today to tomorrow. For any of the so called goals and what government is going to do, what is he going to enact? At least Romney had a five point plan. What we heard from Obama was a vision. And he pulls numbers out of a hat. 100,000 new math and science teachers. 600,000 more people working in natural gas. Two million more trainees, and he doesn't say how we get from A to B. It's a vision. I have a vision of an America where there is no disease and everybody has a private airplane, but unless I tell you how we get there, I’ve said nothing. And what is so surprising, is that - all he had left - he can't speak about his record on the economy, and it's not a good one. As we heard, he didn't speak about achievements, the one that's liberals like, ObamaCare, stimulus and etc… they're unpopular. KRAUTHAMMER: Well, it is the heart of the debate with Republicans and Romney. The heart of the debate between left and right, since the French Revolution. The individual or community, and he stands for the community, which he translates as government. So with that abstract, a cleverly sealed argument. But, that is not what you're talking about in an acceptance speech, when you've been in power for four years. People expect you to say I’m going to do X, Y, and Z, and we didn't hear any of that. So, as a philosophical issue, yes, but without any of that meat on the bone, I think it rings quite hollow. KRAUTHAMMER: I think it does [affect Independents] and I think it's a negative. If you're an independent and aren't a committed person on the left or right. And you were sort of a pragmatist, and you’re listening and the President offers you numbers out of a hat, he wants a lot of this and that. He’s mentioning again and again with wind and solar and algae, but he didn't use a word, he used biofuel. And you say, I’ve heard this, this is nothing new. This, is what he tried, he talked about. Where is the meat to make me think that I should have hope and faith? That we will achieve anything? That is what I think he's lacking. I think for independents, it will send him somewhat backwards. Brit Hume On Obama's Speech: "Significant Number Of Straw Men"
Ed Schultz On Obama's Speech: "He Made Me Feel Good Tonight"